Vis and the islets around it are an attractive destination for many despite being on the open seas of the Adriatic. Hidden in the rocky terrain, the many sea caves make for an exciting invitation to explore the islands and their fascinating interior. 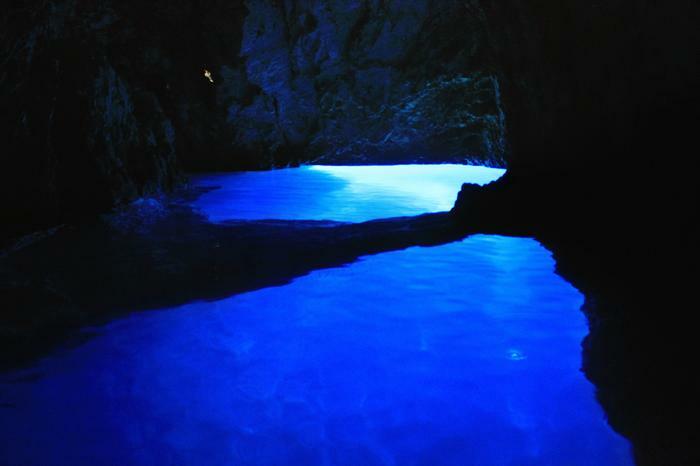 The Blue Cave is the undoubted favorite amidst the countless sea caves of the waters around Vis. It can be found on the islet of Biševo, which can be reahed by a short sailing excursion, easily arranged, from picturesque Komiža. The sunlight's refraction on the surface of the sea and its passing through an underwater opening is a complex natural mechanism which adds a magical bluish tinge to a silvery sheen resembling moonlight. The intensity of the cave's coloring has been leaving visitors to the Blue Cave speechless and indeed breathless for many years. The entrance to the cave is an adventure in itself. A small boat with a handful of people is all that can be admitted; and if the day is at all windy, the entire "crew" must duck, with their heads no higher than the boat's rim. Particularly notable among Biševo's twenty-six caves is Medvidina spilja, or Sea monk cave. Its great beauty was first recognized forty years ago, when it was declared a protected monument of nature. The name comes from the cave's former inhabitant, the Mediterranean seal known as the sea monk, today an endangered species. The cave's most memorable feature is the strange "imbalance" of a wide, cavernous opening and a tapering interior which becomes progressively more dark as one goes deeper into the heart of "Medvidina". The Green Cave on the islet of Ravnik is named for its light effects, similarly as the Blue. Cracks in the ceiling allow the sun's rays to reflect in the cave's interior. As it is fairly spacious, visitors can even go for a swim in the surreal emerald light. The Queen's Cave on Vis itself was named according to the legend which suggests the Illyrian Queen Teuta once lived here. The name is not the only regal thing about this cave - its many chambers make for a magnificent ambience, where the curious visitor can witness the sea's centennial sculpting.